A life-long West Brom fan was made to don the golden football strip of Wolves by his joint best men and sing outside the Hawthorns as a Stag Do Prank. According to the Mirror’s website Kieran Handley was made by his joint best men to sing about Steve Bull outside the Hawthorns stadium before going on his stag weekend – you can see the video here. The cruel / crafty best men said he they thought he would hate it but secretly he enjoyed it, are you sure about that? We have a fantastic list of Stag Do pranks which can be found on our blog. 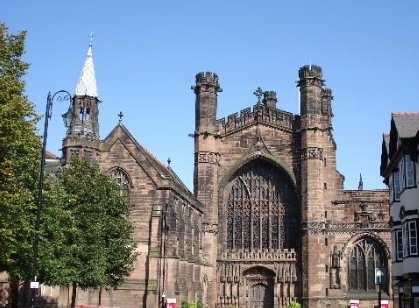 Most hen parties take place in destinations of wild and raucous nights however in 2014 The Chester Cathedral hosts it’s first ever hen party in over 900 years. According to the Chester First website, Hannah Lloyd has always wanted to climb the 216 steps up to the top of the Chester Cathedral and see for herself the stunning panoramic views of Chester. It all came about when Hannah told her mate Anne Cody, she was getting married, now Anne knew Hannah wanted to climb the steps of the Cathedral and luckily she knew the Diocese of Chester. So last Friday night Hannah Lloyd was the first ever hen to celebrate her hen party at Chester Cathedral on the strictest instructions that no alcohol was to be consumed on the tower tour, which is fair enough. After the Cathedral tour she went into Chester for a few drinks, hen party business as usual then! Hannah is set to marry Paul Jones on September 27th which she told reporters she was pretty sure he wasn’t going to celebrate his Stag Do in a church! According to the Irish Examiner Kerry Katona (from Atomic Kitten) had a huge bust up with her fiancé George Kay leaving all the members of their joint stag and hen do abandoned onboard a Thames luxury cruise liner. Apparently the couple celebrated their pre nuptials together by having a spa day before having a disastrous argument in their hotel bedroom. They planned to meet all the other stag and hen members onboard a luxury cruise member moored near the Hotel Verta in Battersea however Kerry refused to come down from her hotel bedroom. 45 minutes later the party was cancelled and everyone onboard was told to get off! Apparently Liz McClarnon (another member from Atomic Kitten) valiantly tried to save the celebration and talk to both the stag and hen but apparently Kerry refused tom come down. Joint hen and stag dos can go either way and unfortunately this celebration went the wrong way. Find the full story here on the Irish Examiner. A comedy for BBC 2 called ‘Stag’, written by George Kay and believed to be produced by the The Wrong Mans producer Jim Field Smith is set to hit our screens in 2015. This six-part series is set in Scotland when a group on a Stag Do start to get mysteriously killed off, I know it doesn’t sound very funny but if it’s produced in the same way as The Wrong Mans we are in for a gripping and hilarious comedy series. We love comedy at DesignaVenture and when it’s themed with something we love best ‘Stag Dos’ we are more excited than a puppy that’s just found it’s tail. You can find more details about this new show ‘Stag’ on the British Comedy Guide website. At DesignaVenture we are always on the look out for fantastic corporate activities or something to do on your stag or hen do. We are quite chuffed with our new finding of pizza making. I know it’s not like jumping off cliffs or racing 60mph karts but hey, some activities don’t have to include danger, unless you fall into the pizza oven that is! Before you start your Pizza Making have a seat, a glass of Prosecco and take in some facts on the origins of pizza and then how to get the best of your ingredients. 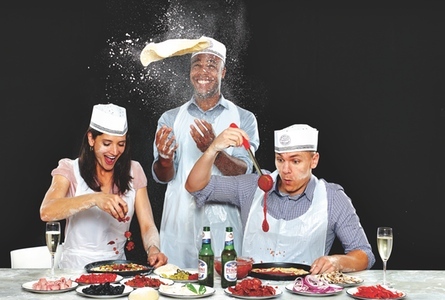 Then it’s pinnies on and learn the art of ‘pizza flipping’ (tossing pizza dough in the air) before adding your own toppings. To keep the group entertained to the end there’s a head to head competition before popping your pizza in the massive ovens. You then get to sample your’s and everyone elses’ pizza with the chance of purchasing a couple of drinks – how cool is that? A total unique Stag Do Idea, a fantastic hen party activity or an amazing corporate activity. Tried and tested by the DesignaVenture team. A man from Sowerby Bridge near Halifax stole £21,000 from a firm he worked for to purchase fancy dress items for a Stag Do, now this is how it first reads on the Halifax Courier website. However, he obviously only used some of the £21,000 he stole to buy fancy dress items for a Stag Do he was going on, no one can spend £21,000 on fancy dress, surely? Reading further on, this article actually states he only used some of the money to fund his fancy dress wardrobe, it doesn’t state what else he bought. 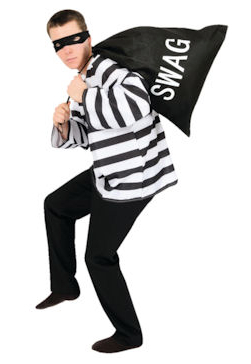 We we were wandering if the fancy dress items he bought included a stripy top, black trousers, a black balaclava and a bag with swag written? The man in question (who now has a new job) went to court and received 275 hours community service and a 10-month suspended prison sentence from the judge, no comment! You can’t write it, only in this country would you find a Hen Party at a Sausage Festival chatting with the Cabinet Minster William Hague. According to the Manchester Evening News, the hen party was staying on a Glamping site in North Yorkshire where they were given free tickets to the local Sausage and Beer Festival. The group spotted William Hague getting out of his car as he came to the Sausage and Beer Festival to judge the winner, he chatted with the hen party apparently complimenting them on their outfits and asking about the wedding and the hen do. For this we are now calling William Hague the Haguemeister, most cabinet politicians would have shied away from these type of situations and wouldn’t want to be seen talking to a hen party however, he did quite the opposite, he even posed for a photograph with them – what a star. We salute you The Haguemeister.